Chinese firefighters spent on Thursday struggling to extinguish a blaze on a stricken oil tanker as criticism mounted in Iran if enough was being done to locate dozens of its missing crew members. 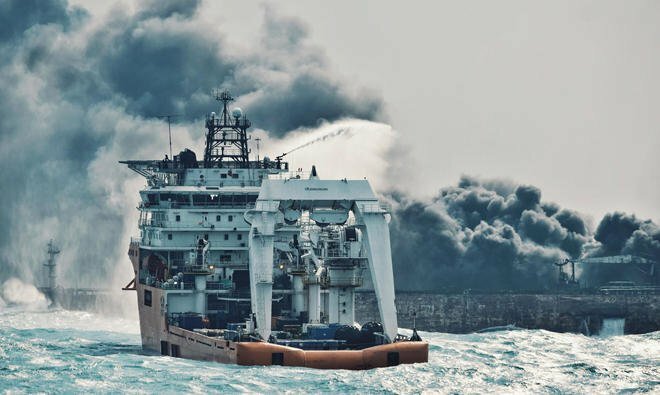 The Sanchi, carrying 136,000 tons of light crude oil from Iran, has been in flames since colliding with the CF Crystal, a Hong Kong-registered bulk freighter, 160 nautical miles east of Shanghai on Saturday. One body has been found but 31 sailors — mainly Iranians — remain missing with officials in Iran hoping they have found sanctuary on an unaffected part of the vessel. Cleanup and rescue ships have faced toxic fumes, rain and windy conditions as they scrambled to find survivors and avoid a massive oil slick since Saturday’s incident. China’s Transport Ministry said Thursday evening the Panamanian-flagged 274-meter tanker remained on fire, adding two ships had spent the day spraying the vessel with retardant foam. But rescue efforts were still being hampered by “terrible” weather conditions and toxic gases from the burning oil which “pose a great danger to rescuers,” the ministry said in a statement. Of the 30 Iranians and two Bangladeshis on the Sanchi’s crew, only one body has so far been found and there has been no word from them since the collision. Operated by Iran’s National Iranian Tanker Company (NITC), the vessel was taking light crude oil condensate to South Korea. On Thursday the Iranian Merchant Mariners Syndicate, an industry NGO, said it had written to Chinese authorities expressing frustration at the lack of progress in putting out the fire. “It was clear that the Chinese are not cooperating enough,” IMMS vice president Saman Rezaie, told AFP. Iranian news website Khabar Online published video interviews with some of the relatives of those missing. “I don’t know what else to say but just beg them to rescue them as I am sure that they are alive inside,” said one woman, who identified herself as the wife of the Sanchi’s chief engineer. Other relatives said they thought the fire should have been extinguished by now. An NITC spokesperson had previously suggested China might be more concerned with stopping a major oil leak in waters important to their fishing industry than rushing to save crew members. The 21 Chinese crew member of the Crystal, which did not burst into flames, were all rescued. Next: Legality is matter of power not certainty of Justice.